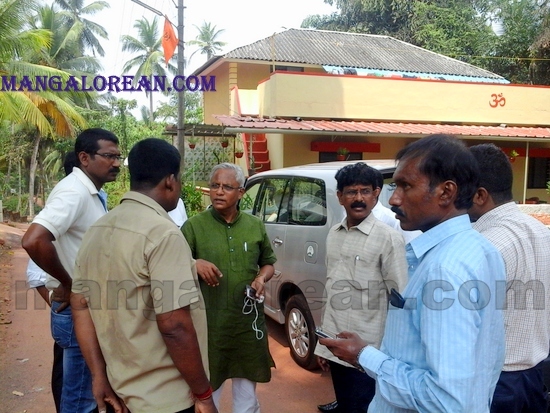 Mangaluru: MLA J R Lobo visited the house of Dayakar Bangera on April 1 and assured monetary help within three days. Dayakar Bangera's legs were amputated 6 years ago and he has been moving around on a wheelchair ever since. His wife is working in a photocopying shop and taking care of her husband. Recently, the mangalorean.com team visited Dayakar Bangera and had published an article highlighting the difficulties that Dayakar was facing and requested its readers to support and help him have a roof over his head as his house had collapsed on March 24. Lobo, after visiting Dayakar and seeing his condition and the condition of the house he was living in, assured to provide monetary support. Lobo called the Village Accountant and asked him to release maximum funds under the Calamity Relief fund for the family. Lobo also assured to provide Rs 10,000 to Rs 15,000 through the Mangaluru City Corporation under the Kuteera Bhagya scheme. Moreover, Lobo promised to collect some funds from party members to construct a house for Dayakar. Team Mangalorean also met J R Lobo on April 1st and urged him to help in building a house for Dayakar as soon as possible before the rainy season starts. Readers of mangalorean.com are also contributing their mite towards building a house for Dayakar and with the help of the government Dayakar can soon expect to get a new roof over his head. The mangalorean.com team also spoke to the Minister for Health and Family Welfare U T Khader in this regard. Corporators Lancelot Pinto, Keshav Maroli, Congressmen TK Sudhir, Ramanand Poojary, Krithin Kumar and Vinay Mascarenhas were also present. I am sorry for Mr. Bangera. There are many Bangera's in our society. I recently read of one Mervin Vaz. Some one had donated him a self managed Wheel Chair. He couldn't have it because it went against the land laws. I heard today all the obstacles removed so Mervinf could have the Wheel Chair. It's because of the report in the press.